In the last session we took the metadata games app pulled in a bunch of images from astronomy books up on project gutenberg (It’s easy to find the image files in their books) and stood it up as a way to crowdsource identification of images from these books. 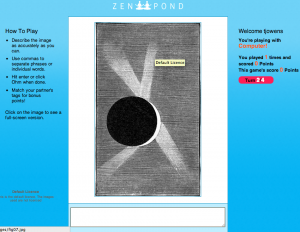 Read about metadata games here. In the session our group worked up some details on how this might work more broadly, but we were actually able to stand the thing up with metadata games as the beginnings of a proof of concept. Here it is and it totally kinda works! As part of the Powerpoint Unhinged challenge, Matt Gold, Zach Coble and myself have put together a presentation/performance based on a title by Matt Gold. For the Maker Challenge, I began an Omeka archive named Story Study. As part of my graduate studies at Kean University in New Jersey, I am researching fairy literature and folklore in order to produce a fantasy fiction manuscript which explores and celebrates the motifs we so enjoy in storytelling today. The biggest challenge to my research is that resources seem few and far between–not at all rare, but scattered across print and digital mediums, and tucked away in larger, general archives such as the Library of Congress. Story Study would be an ambitious attempt at cataloging everything fairy and folktale into one massive database, much like what has been accomplished with the fairy tale section of Amalia, the German-based encyclopedia. Included in the archive would be digitized artwork, manuscripts, essays, poems, and much more–including a detailed collection of the Aarne-Thompson-Uther classification index that stratifies tales by type, theme and motif. Other future possibilities may be biographical accounts of important persons in the field. My short term goal is to maintain a place to compile my research, but I aspire to make this into a hub of fairy and folk literature resources that is both intuitive and creative. In the rich soup that is digital humanities, there are a few ingredients that lend a special flavor. One of these is collaboration: far from being taboo, collaboration is the encouraged mode of working. Another ingredient is open source: we borrow and build on each other’s code and data to make even more interesting things. A third ingredient—one we haven’t quite added enough of—is credit. Digital humanists believe that everyone who contributed to a project should get full and fair credit. These DH values are the impetus behind my contribution to the maker challenge: a plugin for Omeka called Honor Thy Contributors. Honor Thy Contributors is intended for Omeka sites that have multiple collaborators who have added items to the project. It extends the Omeka open-source platform. It’s primary feature is to give credit to the contributors by making transparent what each person’s contribution is. 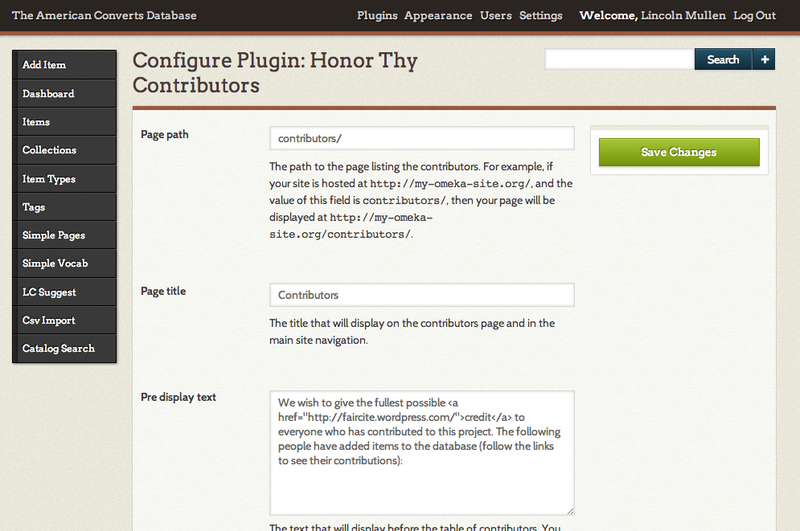 The plugin lets you edit the title, the URL slug, and the text before and after the table of contributors. For now the plugin uses a method to calculate the number of contributions that is convenient for the way we do things at the American Converts database, but I’m currently working on an update that makes it more congenial to the way things are done on every Omeka database, especially sites that use the excellent Contribution plugin. The code is on GitHub. Check out the develop branch for ongoing development, but download the stable version from the master branch. Here is the link to a ZIP file of version 0.1.1, the working version as of the Saturday afternoon of THATCamp. Once the plugin is sufficiently tested I’ll send it to the good folks at Omeka for public display. 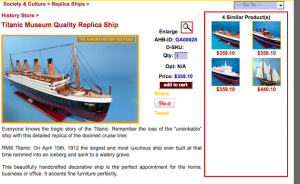 I propose a site like Thingiverse.com for scale models of historical objects. Like the Aurora History Boutique, but you can print the items, rather than buy them. Buy a copy for $400 or print one of pennies on the dollar. Perhaps not even a separate site, but use thingiverse, but encourage and develop a set of tags and/categories that raise the awareness of historical scale models. Cause honestly, this is what we want, scale representations of dinosaurs! I created this visualization using D3. I’d never even used HTML before yesterday (Patrick Murray-John can attest that I was asking him how to get started). So, no real labels yet. My hope is to eventually use visualizations to play with concepts. Over the last 3 years I have been the unofficial keeper of the THATCamp Google Documents folder. After each THATCamp I could keep track of, I tried to collect all the Google Docs available publicly into a public folder. Later I began to archive them as a zip file to avoid losses from people accidentally moving the items out of the folder. With this THATCamp’s move to Participad it seems like Google Docs will become a thing of the past. But the years of notes, links, ideas, session proposals and generally nifty stuff are still out there, and it would be a shame if they were lost to the shift of tools. So, using Sigil, I’m taking the entire current store of Google Docs from THATCamps and converting them into an organized, sorted eBook. That eBook will include all the notes that I have access to, as well as the two Twitter Archives I maintain control of. It will be free, easy to download and ready to become the next big reference book on your Kindle. Here’s the eBook, version 0.5, EPUB Edition: THATCamp the Google Docs Archive | Read it in your browser right now! Hey everyone! Here is my post for the Maker challenge! 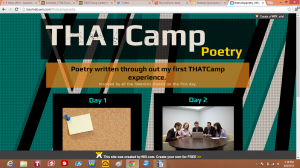 I was really inspired by the limericks that everyone shared for the first session so I created a website that shares all of the poetry that I have written for THATCamp. It is all written about my experiences at the camp! My entry for the Maker Challenge is WP DPLA, a WordPress plugin for displaying related items from the Digital Public Library on your blog posts. The DPLA has lots of cool content, and WP DPLA is a way to help your readers discover and explore that content. 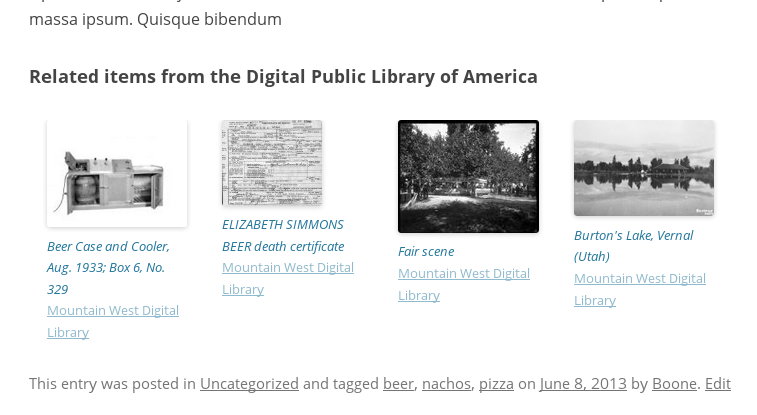 It takes the tags you’ve assigned to your post – say, cheesehead and Packers or pizza, beer, and nachos – and fetches four random items from DPLA’s partner collections, and displays them at the bottom of the post. Getting an API key from DPLA requires sending a cURL request. WTF, you say? The WordPress plugin has a button that’ll send the request for you, and a handy form where you can enter the API key when you’ve gotten it via email. For the sake of variety, the items will cycle. But for the sake of speed and efficiency, they don’t cycle on every pageview – only every five minutes. Don’t want items at the bottom of your posts? There’s a Settings page in the Dashboard where you can turn the feature off, and use the bundled sidebar widget instead. Check out the plugin in action at the demo site (click through to individual posts). The code is hosted on Github (if you clone the repo, make sure you init and update the submodules). And if you’d like a zip download to try on your own WordPress blog, download it here.